In one of my prior posts I already had a look at the parallel inventory valuation issue. For details, please see this site. While the prior post focused on the Russian dual warehouse functionality, this post focuses on an alternative parallel valuation approach I recently came across. A major advantage of this alternative approach compared to the Russian dual warehouse functionality is that it does not depend on country-specific features but rather makes use of generally available functionalities that can be applied in every Dynamics AX/365 for Operations environment. Let’s get started by having a look at the underlying business scenario for this parallel inventory valuation approach. The following illustrations and explanations are based on a company that makes use of standard costs but requires an ‘actual cost’ evaluation for external reporting & tax purposes. In order to explain the underlying parallel inventory valuation approach, the following sample transactions have been recorded for a trading item; that is, an item which is not used in the production process. The sample transactions illustrated in the previous figure start with the purchase of 50 pcs of the trading item for a price of $110. As the item is set up with a standard cost price of $100, a purchase price variance (PPV) of $500 results. The second sample transaction also relates to a purchase order where another 150 pcs of the item are purchased for a price of $95. The major difference between the first and this second transaction is that the second one is only packing slip updated whereas the first one is packing slip and invoice updated. The third and fourth sample transactions represent (internal) inventory adjustment postings for which no purchase price variance arises. Those internal transactions are followed by a third purchase order related transaction where another 250 pcs of the item are purchased for a cost price of $105. Finally, 50 pcs of the trading item are sold to a customer. As the item is set up with standard costs of $100, the inventory value is reduced by a total of $5000. After all sample transactions are recorded, an inventory value of $45000 remains in the balance sheet (BS) and a PPV of $1000 in the income statement (IS). The next figure illustrates the respective financial statement reports. My next step was making a manual inventory value calculation for the sample transactions in order to get an impression of the theoretically correct actual cost inventory value. To achieve this, an average cost price has been calculated before recording the different (internal and external) issue transactions. This calculation is similar to what one can identify in Dynamics AX for a weighted average cost price valuation and is exemplified in the following figure. Depending on how the average values are calculated – before each issue transaction or for the whole period – different actual cost inventory values result. As an example, if a single average cost price is calculated and used for the valuation of the issue transactions, a total inventory value of $45849.06 results. Those valuation differences do, however, not matter here because they have only been shown for explanatory purposes. What matters though is the fact that the issue transactions, which have been recorded with the standard cost prices, require some adjustments in order to arrive at an actual cost value. The way how those adjustments can be calculated is illustrated in the following figure. What can be identified from the previous figure is that the total PPV is split up based on the relationship between the total receipt and total issue transactions. As an example, the $868.85, which are assigned to the total receipt transactions are calculated as follows: $1000 / ($53000 + $8000) * $53000. If only external receipt and issue transactions are taken into account; that is, if the inventory adjustment transactions, which did not generate a PPV are excluded from the calculation, the following PPV amounts are calculated and can be assigned to the receipt and issue transactions recorded. Building upon the last separation of the total PPV, an actual cost inventory value can be approximated by shifting the fraction of the PPV that can be assigned to the receipt transactions from the income statement to the balance sheet. The next illustration exemplifies this. After having analyzed the theoretical concept how an actual cost inventory value can be approximated for a company that uses standard costs, the question arises how this theoretical concept can be implemented into Dynamics AX/365 for Operations? The answer to this question are General Ledger (GL) allocation rules that can be used for transferring the part of the PPV, which relates to the receipt transactions, into the company’s balance sheet. The next screen print shows the allocation rule used. Please note that this rule is set up with the ‘basis’ allocation method. The ledger account that records the PPV for the trading items – account no. 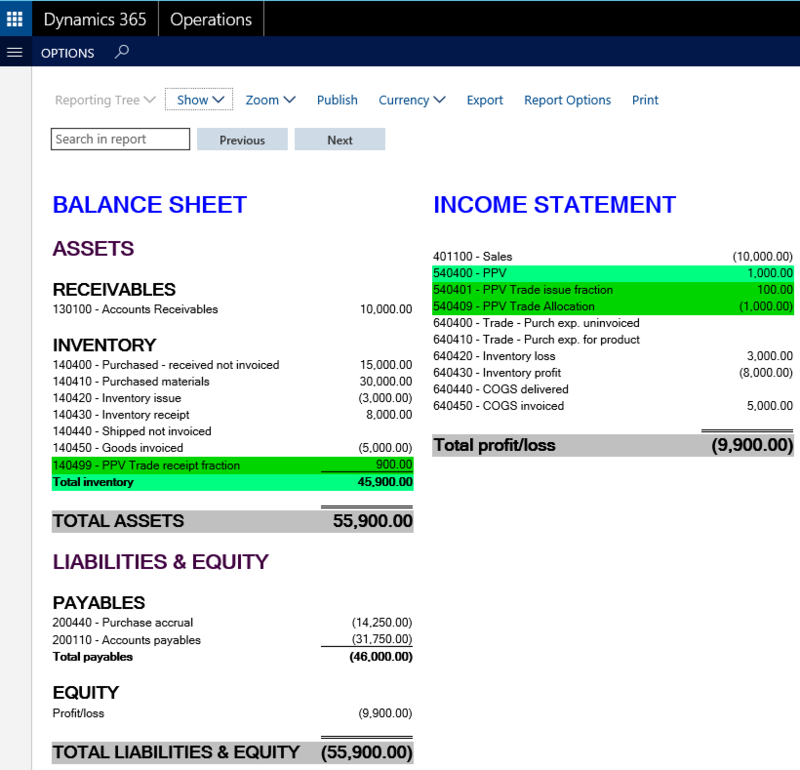 540400 in the example – is included in the ledger allocation source form and will be used as the basis for the subsequent allocation calculation. Please note that the allocation basis is defined in combination with the financial dimension ‘item group’, which has been assigned to all trading items. Referring to the item group rather than using separate allocation rules for each individual trading item is a simplification that will not result in an individual but a group-based inventory valuation of the item. From the author’s perspective, this simplification appears to be justifiable, as companies regularly do not report inventory values on an individual item basis in their external financial statements. The next setup required for using ledger allocation rules concerns the offset account, which should be different from the PPV account that is used in the ledger allocation source form shown above in order to allow users tracking the original and adjusted PPV. Finally, ledger allocation rule destinations have to be set up that define the account-financial dimension combinations to which the PPV will be allocated. The next screen prints show that the part of the PPV that relates to the issue transactions is recorded on the income statement account 540401. The part of the PPV that relates to the receipt transactions is, on the other hand side, recorded on the balance sheet account 140499. Once the ledger allocation rule is setup and activated, it can be processed. Processing the exemplified allocation rule results in the following voucher, which debits the PPV income statement account 540401 for the part of the PPV that remains in the income statement. The remainder of the PPV is consequently shifted to the balance sheet account 140499. 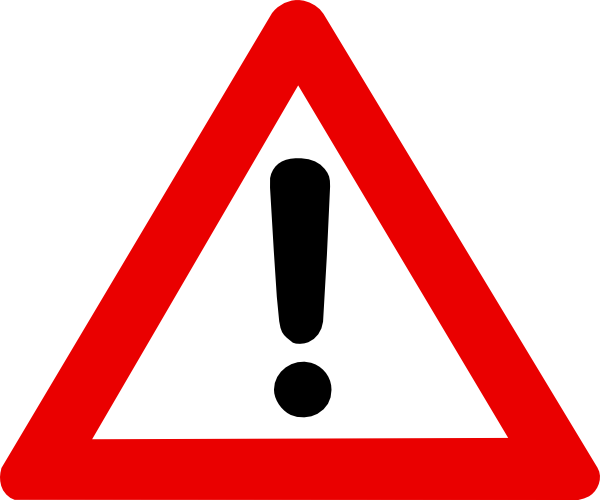 In order to avoid a double counting of the PPV, the credit transactions on the income statement account 540409 offsets the posted PPV. 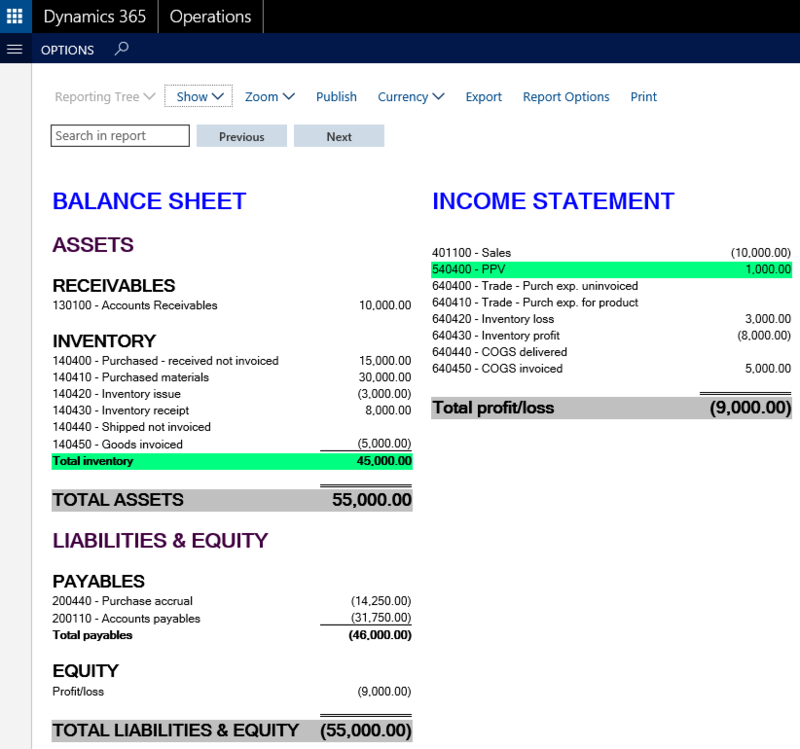 The following screen print summarizes the resulting balance sheet and income statement reports after the allocation rule is processed and posted. The parallel inventory valuation approach illustrated in this post requires that all items are set up with an ‘item group’ or ‘item’ financial dimension. In addition, separate issue and receipt accounts need to be set up for the different inventory transaction types. That the approach illustrated requires the use of standard costs. 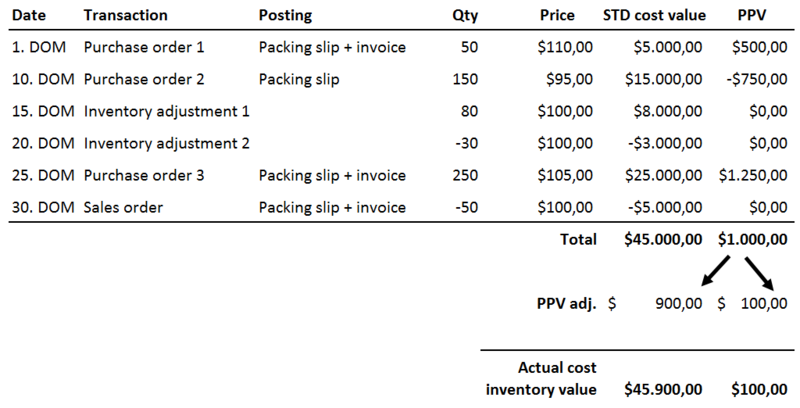 Despite those disadvantages, the inventory valuation approach demonstrated here seems to be much better suited than alternative approaches the author came across, such as creating specialized and complex inventory transactions reports that are used for recording manual adjustment postings at the General Ledger level or doing some ‘creative’ Excel calculations in order to arrive at an actual cost value amount which is subsequently posted in the system. What is more, the approach illustrated here is in line with the ‘specific identification’ valuation methods that are allowed to be used by IFRS and US-GAAP. The next post will extend the approach exemplified here to the other standard cost price variances. Till then.